Appam is one of the traditional breakfast dishes of Kerala cuisine. It is also called 'Paalappam'(Paal means milk) or 'Vella(white)appam'. Its also known as 'Kallappam'(Kallu=Toddy) as traditionally the batter is fermented using 'kallu'(toddy).Appam is a fermented pancake with soft and spongy texture in the middle and lacy crisp edges. To make appam you need Appa-chatti, the pan used for making appam(see figure below). Appam is traditionally prepared from raw rice along with coconut milk, coconut water, salt, sugar, yeast and small amount of cooked rice. At home making appam used to be a lengthy process with preparations starting the day before-soaking rice in water for several hours, grinding it to a smooth paste with flesh of tender coconut and other ingredients and later left for fermentation overnight. Special care has to be taken when making appam because the final texture of appam depends on the way the ingredients are mixed and how the batter is ladled onto the pan. After ladling the batter the pan is swirled so that the batter coats the sides of the pan evenly. The final quality of appam depends to a great extend on this process of swirling that is done only once to get the lacy texture of the edges. The whole process requires skill and it might not be a success in the first attempt. It needs to be mastered! As a child seeing all these gave me the mindset that appam is the most difficult dish to prepare and since I didn't want to get into all the hassles involved I avoided making it for few months after marriage until I got into the conversation with my mother that changed my mindset when she said that it can also be made with rice flour and coconut milk along with other few ingredients. I immediately noted down the recipe and started my appam preparations from then on! Appam forms a perfect combo with any vegetarian or non vegetarian dishes. On occasions like marriage and other celebrations this is usually served with veg/non-veg stew/curries. Dissolve 1 tbsp granulated sugar in 1/2 cup lukewarm water. Add yeast and keep in a warm place for about 15-20 minutes or until it rises/foam forms at the top. In places where the climate varies it might be difficult for fermentation to take place if kept at room temperature. Hence I always keep it in oven. Add semolina to 1/2 cup water in a pan and cook at low-medium heat until it it becomes thick. Keep aside. Grind boiled rice(you may add some water) to a smooth paste. Keep this aside. In a large bowl put rice flour. Note that the size of the bowl chosen should be able to hold double the quantity of the final batter as the batter would rise during fermentation. Add 2 tbsp sugar and enough salt. Mix well. Add yeast solution along with cooked semolina and ground rice. Mix well. Add coconut milk slowly until the batter has attained the desired consistency. If the batter is still thick even after adding the amount of coconut milk mentioned you may add thin coconut milk too. After preparing the batter cover the bowl containing the batter with a lid and leave it to ferment for minimum 8 hours. You may leave this overnight too. Check your batter after this and it should have risen to double the original quantity with foam at the top. Also if your batter has the smell of toddy(liquor) then you need to go no further and proceed with the next step for making appams. Heat the 'appa-chatti'(pan) at about medium heat and grease it with cooking spray/oil. Stir your batter well and ladle some amount into the pan. Immediately swirl the pan so that the batter gets coated on the sides of the pan which later gives the lacy texture. Close the pan with a lid and allow it to cook for about 4-5 minutes. After this amount of time the ends of appam would have a lacy crisp texture and the middle would be thick and spongy. Also the ends of appam would come off. At this stage it is cooked well. Remove from pan. There is a different way of having appam. Instead of making plain appams some people break egg(do not beat it) and pour it on top of appam after the pan was swirled and cook with a closed lid as mentioned above. The end result is you get a sunny side up right in the middle of your appam! Enjoy with any non vegetarian/ vegetarian/ egg dish. 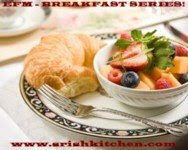 This goes to EFM June-Breakfast Series event hosted by SriLekha. Your Appam are very nice ! Exactly similar as Appam of my favorite indian restaurant ... yummy ! Congratulations for this, sincerely ! I've a question about rice flour for Appam, it's a fine rice flour ( similar as ordinary flour or corn starch texture ) ? or a rice flour like puttu " ground rice " ? Thanks to you.. My husband loved the aapam curry.. It turned out great.. Though, I tried it on a non stick pan(didnt have kadai)it still turned out delicious and spongy.. Thanks once again..